With steely reserve, Insteel Industries (NASDAQ:IIIN) declared it will pay a quarterly cash dividend of $0.03 per share on June 28 to shareholders of record at the close of business on June 14. That rate is the same that the steel maker has paid every quarter since 1985. In December 2012 and, before that, in August 2008, Insteel paid investors a special dividend. Last year, it was $0.25 per share; previously it was $0.50. The new dividend annualizes to $0.12 per share, and yields 0.7% at the closing price of Insteel Industries' stock on May 2. 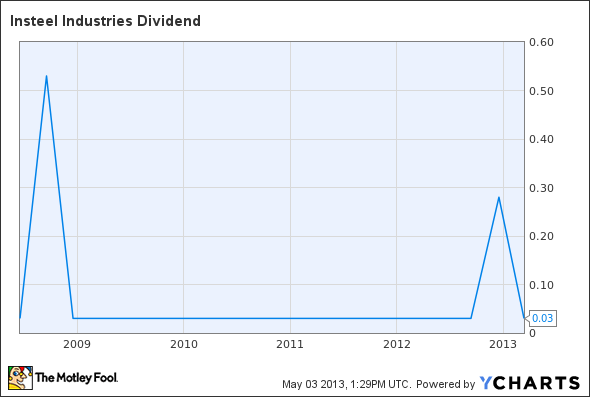 Chart reflects two special dividends paid in 2008 and 2012.